Transboundary water resources are vital for populations, ecosystems and for the development of basins, but these resources are under growing pressure, making it crucial to cooperate for their effective management. However, many obstacles exist that can prevent countries from strengthening or embracing the joint management of transboundary waters in an effective way, which in turn can hinder this cooperative process. This includes a poor or subjective understanding of the benefits that could be derived from cooperation with neighbouring countries. As cooperation is a main obligation under the Water Convention, countries preparing their accession or implementing the Water Convention will evidently reflect on the benefits that cooperation can bring. Benefit assessments are therefore useful and practical tools to promote transboundary water cooperation. Indeed, the adoption of a “benefit lens” can prompt and strengthen joint activities, plans or programmes. Since its publication in 2015, the Policy Guidance Note on the Benefits of Transboundary Water Cooperation has resulted in several international and basin organizations carrying out work on the benefits of transboundary water cooperation. 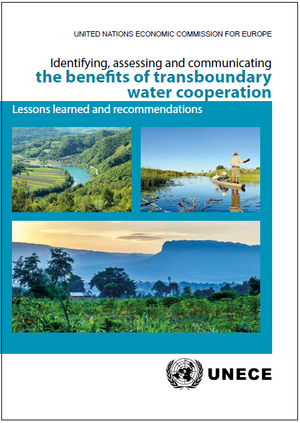 This document primarily takes stock of the three pilot benefit assessments conducted within the framework of the Water Convention’s programme of work in the Cubango-Okavango River Basin, the Sio-Malaba-Malakisi River Basin and the Drina River Basin. It identifies a series of lessons learned and recommendations to help inform the design and implementation of future benefit assessment exercises. This document should interest all those responsible for water resources and who deal with transboundary issues, for example, ministries of foreign affairs, ministries of finance and development planning, sub-national governments of jurisdictions located in transboundary basins, river basin organizations, as well as financial and technical development partners involved in transboundary water cooperation. Download the publication in English.